For this guide I recommend Evil style, standard distribution and helm completion. Evil editing style provides multi-modal editing, so different types of editing is carried out by specific states. One advantage of many states is that single characters can be used for key bindings which puts less strain on your hands whilst typing. Selecting Evil mode will set Vim to be the default way of using Emacs, however, all the default Emacs keybindings will be available. If you select holy mode then only the Emacs editing mode is available as Evil is not installed. Choose the standard distribution of Spacemacs to get all the standard features. A completion framework helps you type less and find commands and file names quickly. Helm is the framework that is the most common and has more features than Ivy. 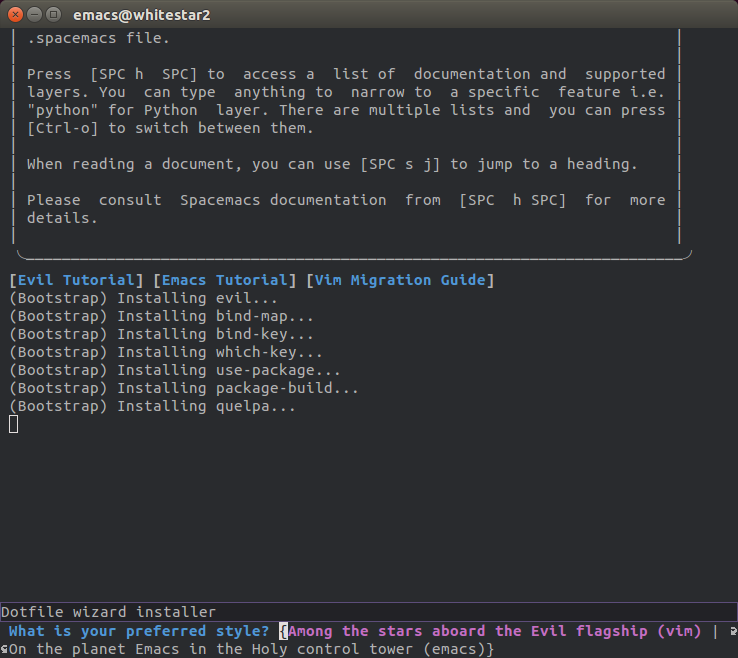 Now you should have Spacemacs up and running and ready to take on the world. In the next section we will configure Spacemacs for Clojure.